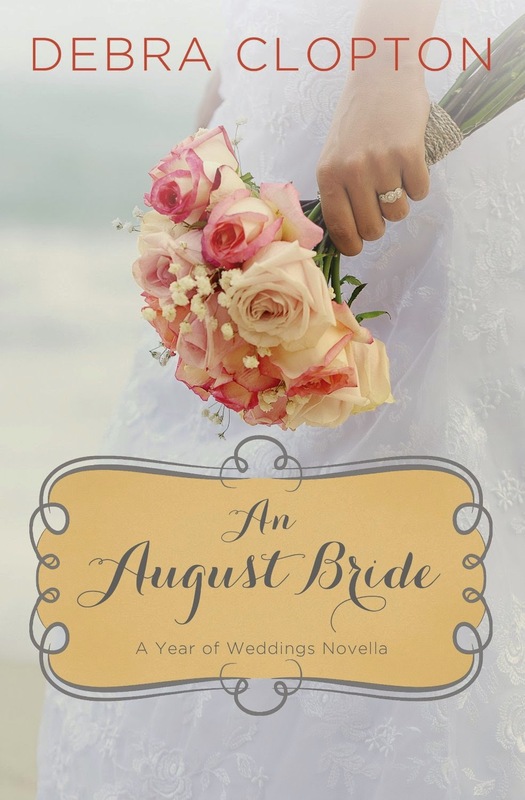 "An August Bride" by Debra Clopton is the next installment in the "A Year of Weddings Novella" series (Book 9). Kelsey Wilcox hated weddings, and cowboys, and ranching. That's why she moved to Corpus Christi and started her bistro in the first place - to get away from the ranching lifestyle. So why does she keep thinking about Brent Corbin, a very hunky cowboy after meeting him at her cousin's wedding? Will Brent be able to patiently wear away Kelsey fear of all things cowboy? I enjoyed reading "An August Bride". It was a quick read (being a novella!) which is nice when you want to have a good romance story without spending a lot of time to get to the happily ever after. Kelsey's aunt and her friends are known as the "Matchmakin' Posse of Mule Hollow" and they throw their best efforts towards getting Kelsey and Brent together and they were like your own crazy aunt with their quirky ways. I liked the characters and felt like a part of the story while waiting to see if they'd get together (Which you assume since a happily ever after is expected in the series!) There was an August wedding, but it was the cousin's wedding and not our hero and heroine, so she isn't really an August Bride, which I kind of missed. If it's a story about a "month" bride, then I think there should be a wedding and several of the books in the series haven't had a wedding at the end. But I still liked the story, just wished for that extra step at the end! "An August Bride" is available on Kindle. I received a free Kindle edition of "An August Bride" from Booklookbloggers in exchange for my honest opinion. There will be a video coming soon! 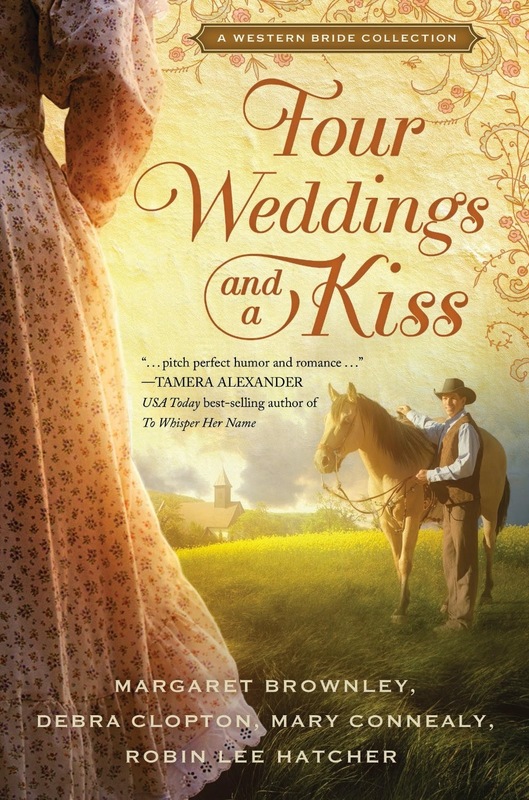 I was given a copy of "Four Weddings and a Kiss" to review through Booklookbloggers. "Four Weddings and a Kiss" is a collection of four novellas, each having to do with a heroine who is a strong, independent woman who can do things for herself. The four novellas are tied together by the Prologue which introduces us to Reverend Gregory Miller. Gregory just broke up with his sweetheart Elizabeth Princeton because she was too "reckless" and wouldn't make a proper preacher's wife. His four preacher compainions each tell him a story about a independent woman they knew and how they found God's leading for their lives. "Spitfire Sweetheart" by Mary Connealy tells about Maizy MacGregor and Rylan Carstens. When Maizy's recklessness causes Rylan to be injured, she becomes his nurse and housekeeper until he heals. In the process, Rylan realizes there is more to Miazy than her tomboy ways. Will they give up their stubborn ways and find a way to love? "A Love Letter to the Editor" by Robin Lee Hatcher tells of Molly Everton who writes a column for her father's newspaper. She is angry when her father hires Jack Ludgrove to be the new editor instead of her. She determines that she will do all she can to make Jack want to keep on moving instead of settling in Killdeer, Wyoming. Jack isn't planning on staying for long anyway as he has always wanted to travel. As they get to know each other, their priorities start to change. Will it be enough to write a perfect ending? "A Cowboy for Katie" by Debra Clopton follows Katie Pearl who lost her father when a tornado leveled their home. Now she's known as Crazy Katie and the townsfolk avoid her. When Treb Rayburn comes into town looking for work so he can buy a new horse and continue on his adventures, Katie hires him to rebuild her home. Can Treb help Katie deal with her demons and will he be able to stick to his plans of moving on once the house is built? "Courting Trouble" by Margaret Brownley tells the story of 'Black Widow' Grace Davenport, accused of killing her third husband. Her son begs attourney Brock Daniels to take on her case and prove her innocence. He doesn't want to take on the case until he meets her and then he wants to figure out a way to get her out of jail. Why does he feel drawn to her and can they find a future together? The Epilogue wraps up Gregory and Elizabeth's story when she picks him up from the train after receiving a telegram sent by the other preachers in Gregory's name. There are Reading Group Guides for each story in the back of the book. I enjoyed reading the novellas and liked that they were quick reads with good Christian morals in them. The stories are also each available individually in Kindle edition. Last month, my aunt's church sponsored a free night at Frederik Meijer Gardens. We had never been, so it was an awesome opportunity to go. I thought it was interesting that I got the "woman" side of the sculpture, but with the "man" shadow on it!